After simple stability for your backyard or garden? This classic teak outdoor extension table and dining set will have you thrilled with the many options available. Our Rectangle Outdoor Extension Table with 8 Prego Chairs is a superb dining set for smaller family dinners or for entertaining up to 8 people. Featuring the Rectangular Outdoor Extension Table 120>180 x 90 and 8 Prego Chairs, this set is ideal! The overall look is classic, and is simple enough to fit into any setting. The Prego Chairs fold up succinctly for easy storage, pop a couple away and fold away your extension and you’re ready for a more intimate gathering. After simple stability for your backyard or garden? 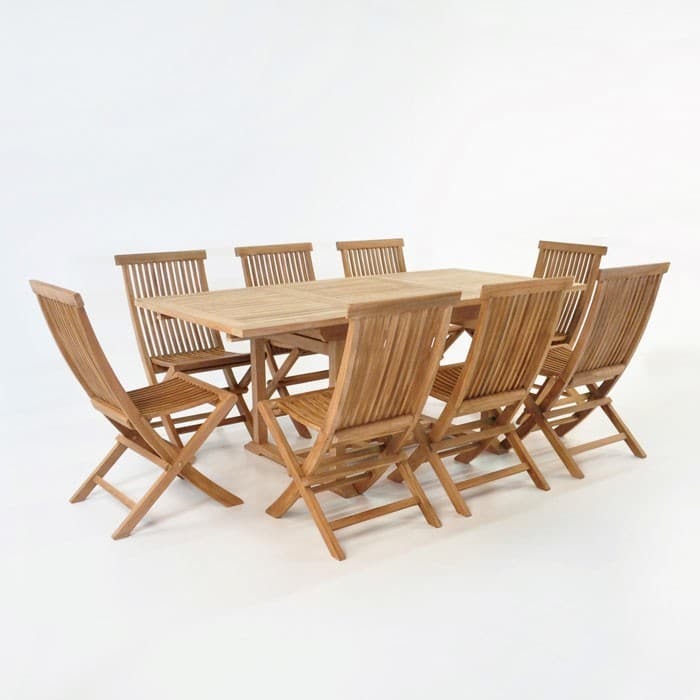 This classic teak outdoor extension table and dining set will have you thrilled with the many options available. Our Rectangle Outdoor Extension Table with 8 Prego Chairs is a superb dining set for smaller family dinners or for entertaining up to 8 people. 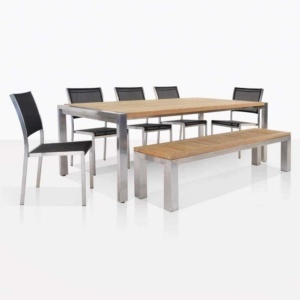 Featuring the Rectangular Outdoor Extension Table 120>180 x 90 and 8 Prego Chairs, this set is ideal! The overall look is classic, and is simple enough to fit into any setting. The Prego Chairs fold up succinctly for easy storage, pop a couple away and fold away your extension and you’re ready for a more intimate gathering. Another feature about this stunning classic teak outdoor extension table set is that it’s easily light and portable, but substantial enough that you can remove or add pieces with ease. So whether you have unannounced guests or an intimate dinner party you can extend or decrease the table, and fold away or bring out more chairs as needed! 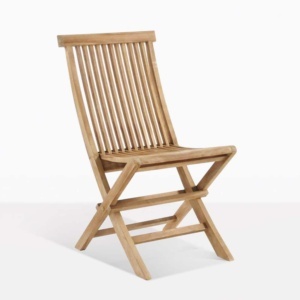 Grade-A Teak is the strongest wood for outdoor furniture and definitely the most attractive. 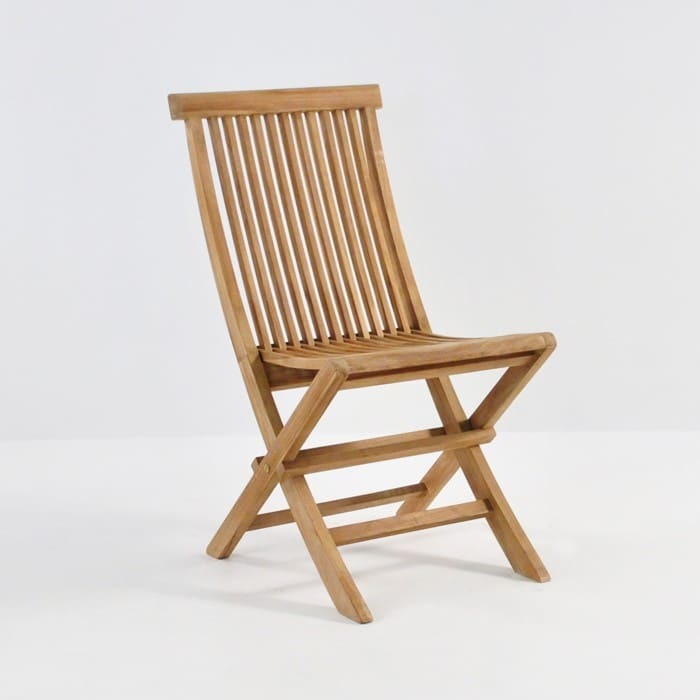 Its properties include a high content of natural rubber and oil, meaning that it is a wood that lasts and lasts! The colour is a lovely honeyed grain, and whilst the teak patinas off after time, that colour (from the oils within the wood) stays beneath the surface, keeping your wood durable and hard wearing. And it means you can always sand back each piece to reveal the colour you originally purchased! At Design Warehouse we don’t skimp on quality products. Whether you love the Grade-A Teak or want a mixed look, we have tons of marine quality products that you can choose from. Pick from Raw Concrete, Stainless Steel, All Weather Wicker, Sunbrella® and Batyline® materials. 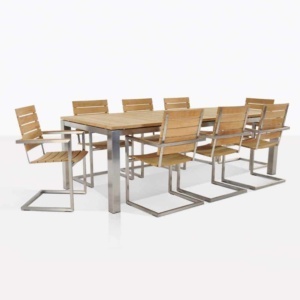 Design Warehouse’s Rectangle Extension Table with 8 Prego Chairs is the finite choice for traditional, stable style. Call us now to discuss options. All items are sold separately, enabling you to truly be the master of your space? Like the table, but need a bigger one? Easy! Want to swap out the chairs for something a little different? Just ask. We can draw you up a quote swiftly at no extra charge. This classic teak outdoor extension table set is just waiting to be set up in a lush garden or on a red brick patio. Surround yourself with loved ones, place the food on the table, and you have created a communal area to appreciate for decades to come.